The exhibition was held in the Rare Books Exhibition space, Sir Louis Matheson Library, Monash University from 1 August - 2 December 2002. From 1961 when the University began, Monash University Library has specialised in collecting seventeenth and eighteenth century English literature, history and theology. 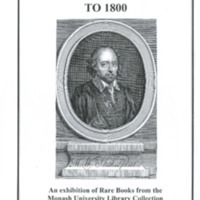 Viewers of this exhibition were treated to a detailed survey of the early centuries of classic English literature. We see early editions of all the major writers from the period, as well as many minor authors. Items range from two 1602 editions of Chaucer to a beautiful copy of the first Blake illustrated edition of The Grave, by Robert Blair (London, 1808).